"Along the shores of beautiful Owi Island may be seen the colorful signs of many a fighter and heavy bomb squadron, but it is the general consensus of opinion that the 403rd 'Mareeba Butchers' head the list of unique names and colorful signs. They gained their grizzly cognomen from an incident that happened while they were based at Mareeba, Australia. The story goes, that the 43rd Bomb Group, in conjunction with the old 19th Bomb Group, allowed a few of their bombs to stray into a Geisha-girl house while on a mission over Rabaul. The damage to the darlings of the Japanese soldiers according to Madam Tojo of Radio Tokyo fame, was a little more than devastating, and she swore vengeance on the 'butchers' of her 'innocent girls'. 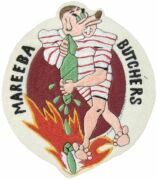 The 403rd Squadron of the 43rd Group, because several of their crews had figured in the bombing, took an almost malicious delight in the attention they received, and they adopted the name, 'Mareeba Butchers'. Since then the 'Butchers' have laid down their bombs on targets from Lao to Davao. So well they have done their job, Madame Tojo continues to threaten them at frequent intervals, on her radio program, and the 'Butchers' accept each threat as an additional incentive to live up to their name, and put their bombs where they will do the most good. However, the name 'Mareeba Butchers', is not the 403rd's only claim to fame. They are, also, the oldest heavy bomb group in the Southwest Pacific, and the first heavy bomb squadron in New Guinea. So when along the beach road, watch for the sign 'Mareeba Butchers,' but don't expect any fresh meat -- they eat it all themselves!" B-24 Combat Crews A list of B-24 combat aircrews who fought in the 403rd Bombardment Squadron from January 1944 through November 1945. Officer Roll Call A list of all known officers to attach or detach from the 403rd Bombardment Squadron from January 1944 through November 1945. 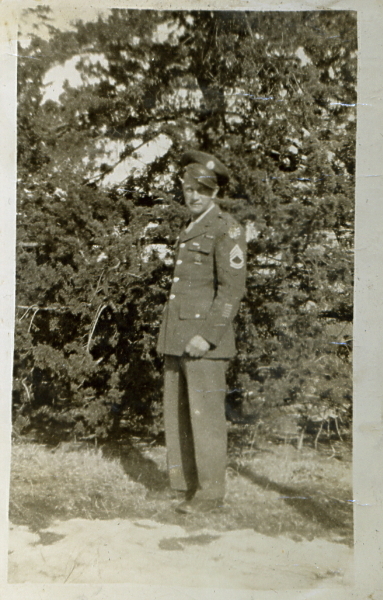 Combat Photographers A list of all known combat photographers to attach or detach from the 403rd Bombardment Squadron from January 1944 through November 1945. 403rd Squadron Deaths Sort database by Squadron by double-clicking on the word "Squadron" at the top of the Squadron column. To return to this page, use your browser back button. Interview with Flt. Officer Raymond A. Emanuelson, Jr.
Theodore "Ted" Romanowski (original Pilot L.A. Young) in front of "Geraldine"